FAREHAM, UK -- (MARKET WIRE) -- November 14, 2005 -- Until now engineers have been concerned about the risk of damage to their expensive PCs when using PC-based oscilloscopes which have no galvanic isolation between the probe input and the USB output. Damage can occur where either the PC or the target are not at the same potential (usually ground). 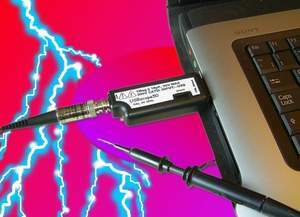 The USBscope50's unique integrated Cat.II 300v isolation virtually eliminates this risk. The USBscope50's unique combination of very small physical size plus professional grade performance in a modular form for easy expansion and maximum economic efficiency, and heralds a new concept in PC-based test equipment, without the risk of costly damage to the host PC. Elan Digital is launching more in their series of miniaturised test and measurement products imminently. Elan Digital is a specialist design house centred on interface technology. A world-wide range of clients uses their products and custom design services. Elan Digital is a privately owned company which has gained unique experience over its 29-year history and uses the latest design & manufacturing technology which makes them one of the leading PC and PDA interface design companies globally. In recent years Elan Digital has expanded its design expertise to include USB, Express Card and SD technologies and has focused its design efforts on unique products for the fast-growing mobile datacomms market. Elan Digital has ISO9001 (2000) approval. Known for their expertise in innovative designs, Elan has a number of international design patents related to their own proprietary products. Additionally, Elan is a winner of UK Government SMART Awards for creative design.